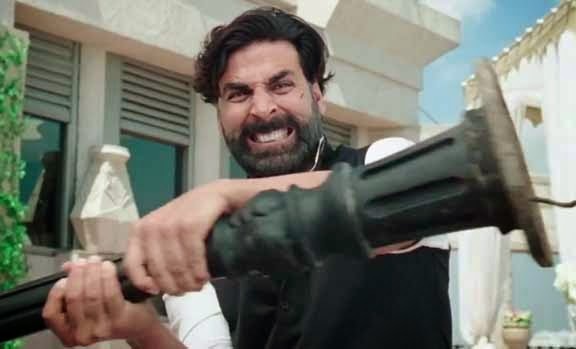 Mumbai : The 'Khiladi' of Bollywood actor Akshay Kumar said on Monday that his upcoming movie 'Gabbar Is Back' is not a sequel of 'Sholay', and Gabbar was not the villain but the hero in this movie. Akshay Kumar will be seen in as Gabbar in the movie. Akshay Kumar told reporters during the trailer launch of the movie, "This Gabbar is different... that Gabbar was the villain and this Gabbar is the hero. This film has nothing to do with that film, this film is not 'Sholay 2'. Both the characters are different." Directed by famous southern director Krish and produced by Sanjay Leela Bhansali and Viacom 18 Motion Pictures, "Gabbar Is Back" features Akshay Kumar and Shruti Haasan, and is slated to release on 1 May. "Gabbar Is Back" is a remake of 2002 Tamil film 'Ramanaa'. Akshay will be seen as a vigilante, a righteous man and an enemy of the corrupt. Asked how did he prepare himself for this role, Akshay said: "I don't prepare for my character. I just follow my director's vision because he knows the best as he knows the script very well. "I follow the director. If I listen to too many people, and give him my vision, that will create confusion. I have always believed that a film is one person's vision and not many people's visions. I always believe in being a director's actor."